During the fall of 1902, a group of 22 youngsters gathered in the garden of Madina Guard Osman Pasha’s mansion located in Serencebey, Beşiktaş on certain days of the week and practiced gymnastics. Led by Osman Pasha’s sons Mehmet Şamil and Hüseyin Bereket, the group, which included well-known neighborhood boys such as Ahmet Fetgari, Mehmet Ali Fetgeri, Nazımnazif Cemil Feti and Şevket Bey, was also interested in wrestling and weightlifting. But at that time, all public gatherings were strictly banned by the Sultan Abdul Hamid II for political reasons. When the Sultan heard of what was taking place in Serencebey, he ordered his special forces to raid the mansion, and the practicing youngsters were soon taken to the nearest police station. Luckily, since most boys were close to the Palace and did not actually engaged in playing football, a forbidden sport at that time, they were let go without being charged and allowed to carry on. Furthermore, in the following days, the sultan’s own son Abdülhalim publicly announced his backing of the boys and attended the practice sessions in person frequently. The famous Turkish boxer and wrestler Kenan Bey also started training the boys on a regular basis. Bereket Gymnastics Club was founded in March 1903 under a special permission from the authorities. After the declaration of constitutional monarchy in 1908, the restrictions on sports were eased considerably. Following the political events of April 13, 1909, Fuat Balkan and Mazhar Kazancı came to Istanbul from Edirne City with the Ottoman Movement Army. After the restoration of political order, Fuat Balkan, a proven fencing coach, and Mazhar Kazancı, a good wrestler and weightlifter, found the boys in Serencebey and succeeded in persuading them to train together. Fuat Balkan allowed the first floor of his house in Ihlamur, Beşiktaş to be used as club headquarters, and the title of Bereket Gymnastics Club was changed to Beşiktaş Ottoman Gymnastics Club. Thus, a sports club with gymnastics, track & field, wrestling, boxing, and fencing sections was founded. Refik and Şerafettin Begs, friends of Fuat Bey, were prominent fencers. 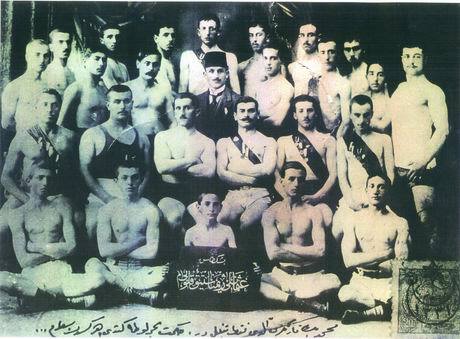 With the support of Beyoğlu Governor Muhittin Bey, Beşiktaş Ottoman Gymnastics Club became the first registered Turkish sports club on January 26, 1911. The interest among local youths in the club grew rapidly, and the number of members actively engaged in club activities went up to 150. The club headquarters eventually was moved from Ihlamur to the larger building, no. 49, in Akaretler. When this building was too small to serve the needs of the club after a while; the building, no. 84, again in Akaretler, became new headquarters. The yard behind this building was turned into a sports pitch.